"Liberated" from Wangerooge, Fresian Islands in May 1945 by "B" Flight, 664 R.C.A.F. Air O.P. Squadron Capt G.E. Nixon (KIA), Capt R.L. Morton, Capt J.M. Sutherland, Capt W.B. Hagarty and Capt G.M. Henderson. 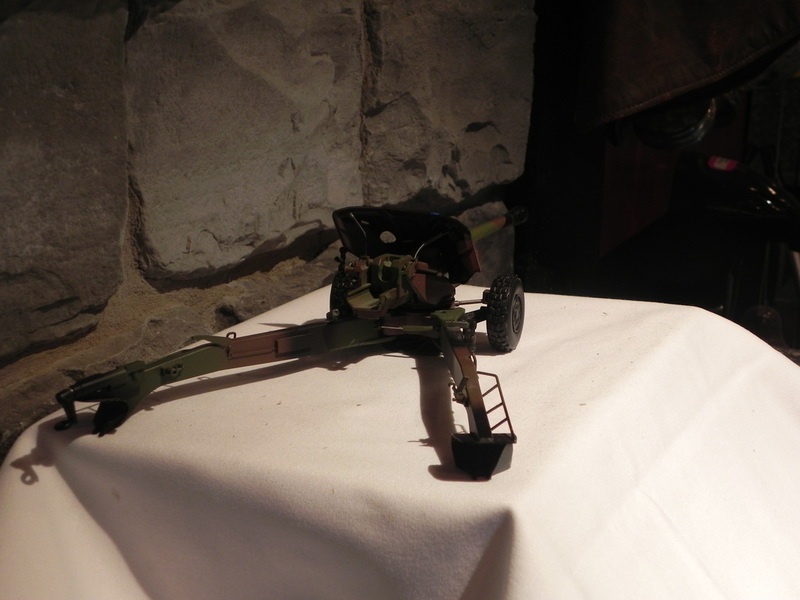 Presented to the Royal Regiment at the Air O.P. Pilots Reunion Dinner, Ottawa, 19 October 1991. In addition to the sword, we have been gifted with a label from one of the other artifacts that were also 'liberated' during the adventure in May 1945. More of the story will follow in the near future! 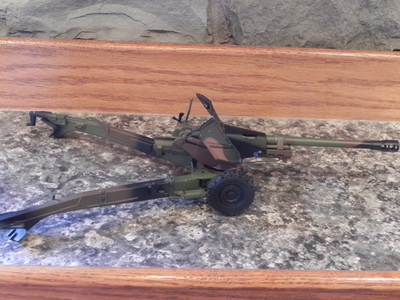 "Blowpipe gunner" (1984) by Colonel (Retired) André D. Gauthier OMM, CD depicts a gunner with the Blowpipe, a man-portable surface-to-air missile (MANPADS) which was in use with 129th Air Defence Battery, Royal Canadian Artillery in the 1980s. 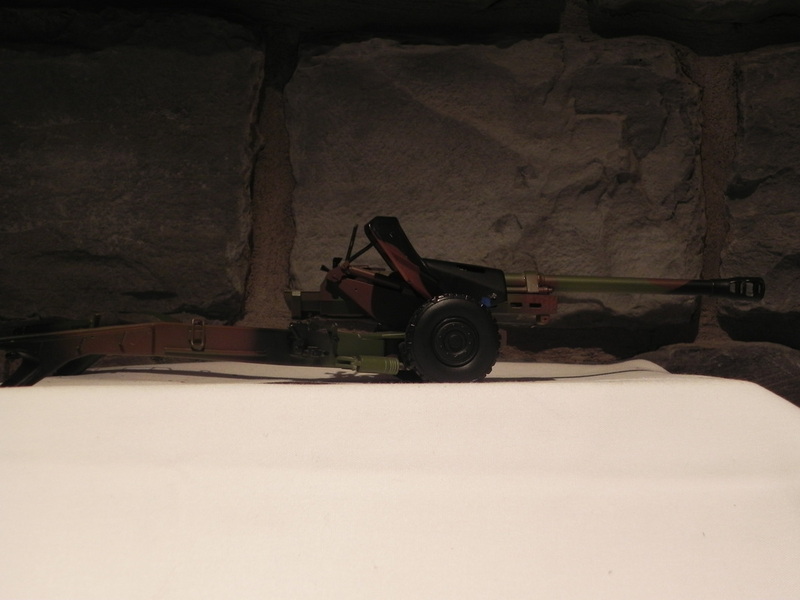 This model was presented to Artillery Section by LCol NH Connolly, Maj HP Mundell, Maj MD Capstick and CWO (Mr Gnr) CM Bowden in July 1985. The Sexton was a Canadian built Self-propelled gun that was modeled after the US designed Priest self propelled howitzer. 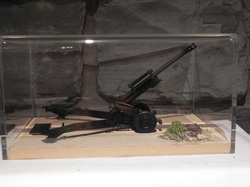 The major change was the use of 25 Pounder gun and ordnance in lieu of the American 105 mm howitzer. It provided artillery support for mostly Armoured divisions. 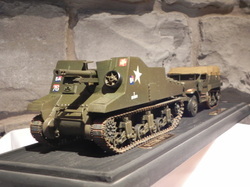 The chassis was originally intended to be the Canadian designed Ram tank (US M3 Tank) but later switched to the Grizzly (Canadian built M4 Shermans). 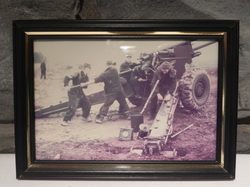 The gold maple leaf on red background indicates 1st Canadian Division. Looking forward to any suggestions as to the 76 and AB tac signs. 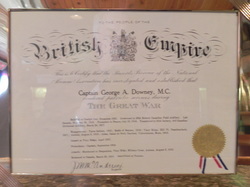 A certificate from the National Alumni Association establishing that Captain Downey did serve in the Great War, having enlisted in December 1915 as a Lieutenant in the 29th Battery, Canadian Field Artillery. He left Canada 26 February 1916 and proceeded to France on 13 July 1916. He was transferred to the 35th Battery, 3rd Canadian Divisional Artillery on 24 March 1917. In 1916 he was present at the Ypres Salient and the Battle of the Somme. In 1917 he saw action at Vimy Ridge, Hill 70 and Passchendaele. 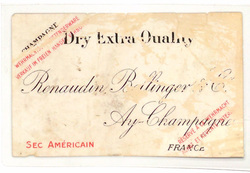 He was at Amines on 8 August 1918 and also was present at Arras, Canal du Nord, Cambrai, Valenciennes and Mons that year. He was gassed at Vimy Ridge. He was promoted Captain on September 1918, mentioned in despatches for Vimy Ridge and received the Military Cross for his actions at Amiens on 8 August 1918. On 30 March 1919, he returned to Canada and was demobilized in Toronto. I'm looking for information on the particulars regarding the Military Cross and why his certificate is in our trophy case. 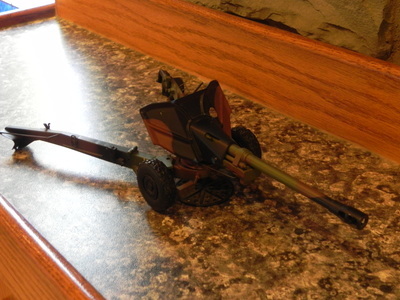 The mainstay of or medium artillery units throughout the 1960s until replaced by the M109 self propelled howitzer. It saw service in both our Regular and reserve units. The picture does not indicate where or which unit is shown. Daniel Charles Spry was the Commanding Officer of the Royal Canadian Regiment during the invasion of Sicily. On December 18th, 1943, Spry was took command of the 1st Infantry Brigade. He was subsequently transferred to the Normandy theatre on August 18th, 1944, to succeed Major-General Rod Keller as Commander of the 3rd Infantry Division. After the war, he was appointed as Vice-Chief of the General Staff at National Defence HQ in Ottawa. 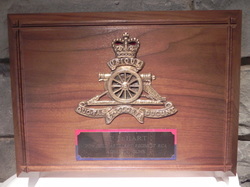 Sponsored by the Ottawa Gunners this trophy is to be presented annually to the student as selected by the Commandant. 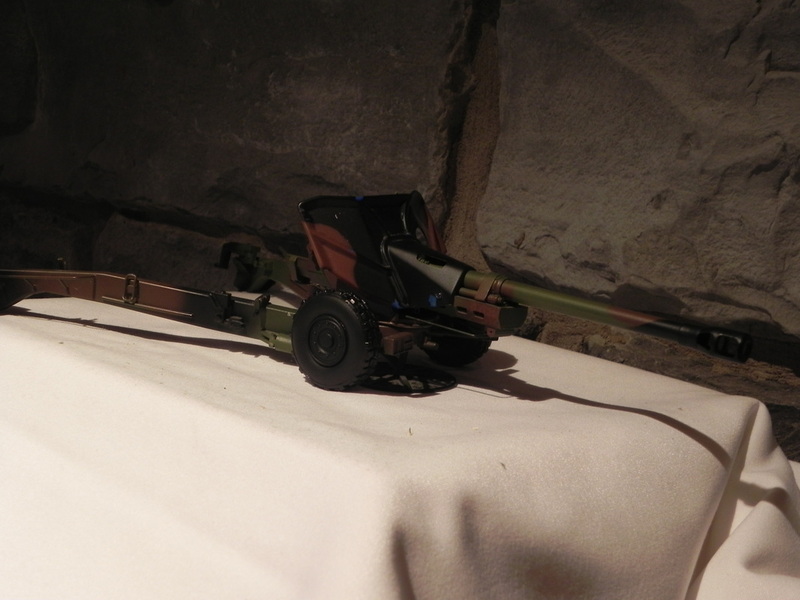 This collection of artillery casings was presented to the Army (Ottawa) Officers' Mess by Major A.W. 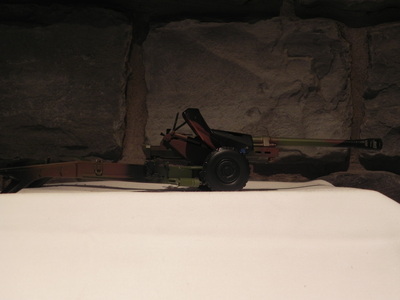 Curry CD (Retd) in 1971 and features a representative set of casings that includes a 105mm casing, a 25 pounder casing and two others. 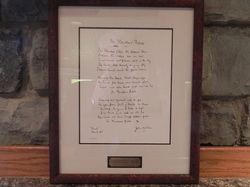 The epic poem written by Lieutenant Colonel John McCrae. This copy was presented to the Canadian Air OP Pilots Association in recognition of their generosity to the RCA Heritage Campaign. 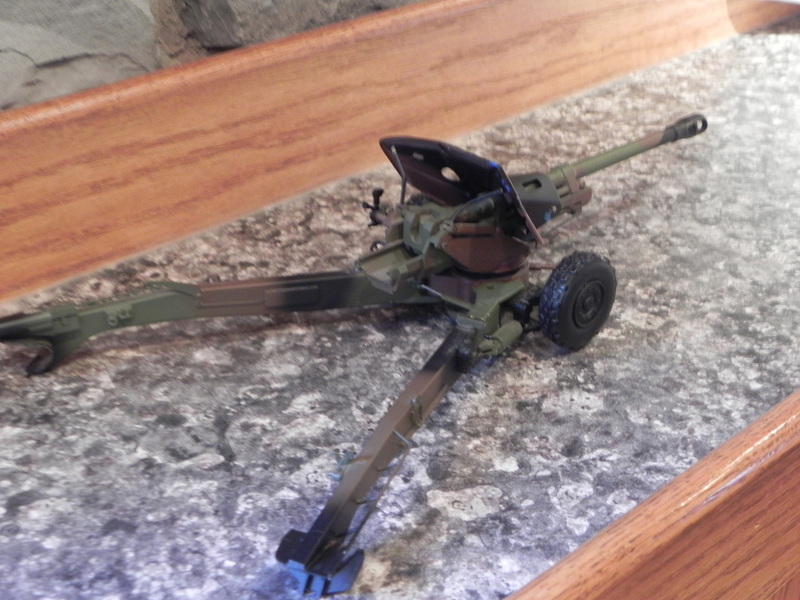 The following six photographs show a die-cast model that is located in our trophy case. 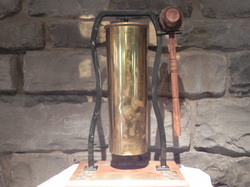 Question #1 - What is it? Question #2 - Where did it come from? 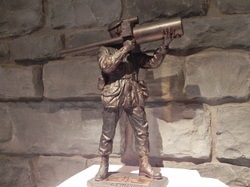 Brigadier General WW Turner, CD, RMC 2816, Colonel Commandant The Royal Regiment of Canadian Artillery 1 September 1979 - 31 August 1986 provided this trophy for the Ottawa Gunners to present to the best third year Artillery Cadet at the Royal Military College of Canada. Names of recipients to follow. 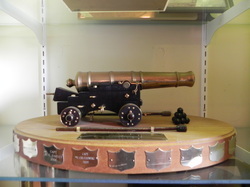 This trophy was presented to the Ottawa Gunners by Major Wilkinson RA. Looking for anyone that may have additional information.